We are excited to make this package available to you – based on the conference of the same name, The Enabling Church Course is a flexible eight-session course exploring how to enrich church life through sharing mission and ministry together with disabled people. The Enabling Church Course was born out of the 2016 Enabling Church Conference and developed by CfA with Lichfield Diocese. Authored by and with disabled people it’s content is informed by experience, relevant to all churches and supported by a range of resources. Since it was introduced in 2017 it has been run in a variety of church settings and has helped many as they strive towards a church that enables disabled people, welcoming people with disabilities of all kinds to church, including them fully in church life and contributing their gifts to the blessing of the church as a whole. Now in 2019 it in available in an updated form. Nothing in this update invalidates the teaching in the course but largely reflects informational and organisational changes that have occurred. 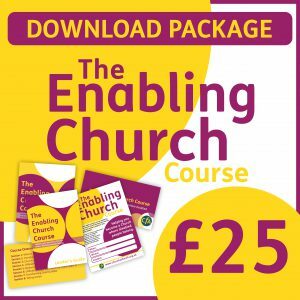 We provide you with everything you need for your Diocese/District/Synod or church group to run The Enabling Church Course: including the Leaders’ guide, video presentations, Course handbook for participants, posters and postcards to promote it in your area. To purchase the course click on the links below. You will be redirected to, CFA Member organisation, Through the Roof’s online shop to process the transaction. Click here to purchase this course as a download package for £25. Click here to purchase this course as a hardcopy for £35.